Not every debt is entitled to be forgiven in bankruptcy. In a recent Northern District of New York bankruptcy decision, Chief Bankruptcy Judge Robert Littlefield Jr. held that a woman’s $3.75 million default judgment against her mother for negligent infliction of emotional distress would be excepted from discharge in her mother’s subsequent bankruptcy case. In re Irene Chaffee (Chaffee v. Chaffee), No. 07-90171 (Bankr. N.D.N.Y. September 3, 2013). The default judgment arose out of an action by Sara Chaffee (“S. Chaffee”) against her mother for failing to prevent, report or otherwise restrain the ongoing sexual abuse by the debtor’s husband, George Chaffee (“G. Chaffee”). The New York bankruptcy court determined that the judgment constituted a non-dischargeable debt in her mother’s bankruptcy case under section 523(a)(6) of the Bankruptcy Code. S. Chaffee suffered years of sexual abuse by her stepfather, G. Chaffee. He was finally arrested and an order of protection in favor of his stepdaughter issued, and he was barred from further contact. Notwithstanding the order, her mother invited G. Chaffee to return to the family home. He was re-arrested and subsequently sentenced to incarceration in a New Hampshire state prison. The debtor was directed to undergo counseling to understand the danger caused to her daughter by allowing unsupervised contact with her stepfather. S. Chaffee and her brother were temporarily placed in foster care. After his release from prison, G. Chaffee violated release conditions by engaging in another unsupervised visit with S. Chaffee. He was remanded to serve an additional year. Upon G. Chaffee’s release, and knowing the prior restrictions regarding unsupervised contact with S. Chaffee remained in place, the debtor again permitted G. Chaffee into the family home. Subsequently, G. Chaffee raped S. Chaffee on three separate occasions while the debtor was at work. The debtor was charged and pled guilty to endangering the welfare of her child, and was sentenced to time-served: three years’ probation. A final order of protection was issued. S. Chaffee thereafter commenced a civil action against G. Chaffee and the debtor to recover for injuries suffered over the years, including from negligent infliction of emotional distress against her mother for failing to prevent, report or end G. Chaffee’s sexual abuse. Both defendants defaulted and a $3.75 million default judgment was entered in favor of S. Chaffee. G. Chaffee died in prison, yet the judgment remained open and unsatisfied against the debtor. In her mother’s bankruptcy case, S. Chaffee brought an adversary proceeding for an order holding the $3.75 million judgment to be non-dischargeable as a “willful and malicious injury by the debtor” within the meaning of 11 U.S.C. § 523(a)(6). The court agreed. Judge Littlefield explained that because the debtor knew or should have understood the risk that G. Chaffee would likely sexually abuse S. Chaffee again if he was left unsupervised with her, the debtor’s actions were also determined to be willful under section 523(a)(6). Inasmuch as the plaintiff here satisfied both requirements of 11 U.S.C. § 523(a)(6), the bankruptcy court held that her judgment debt was non-dischargeable, citing United States Supreme Court and other precedent. Chaffee demonstrates that “willful and malicious” injury within the meaning of 11 U.S.C. § 523(a)(6) does not require a specific intent to cause injury. Rather, if appropriate facts and circumstances can be demonstrated, there is considerable likelihood that such an action or judgment may be deemed sufficient for a bankruptcy court to conclude that a debt based upon willful and malicious injury is indeed non-dischargeable. If you are a creditor or debtor with questions concerning adversary proceeding litigation or challenges to debt discharge or dischargeability in bankruptcy matters, feel free to call or email us to review the particulars of your situation or to set up a meeting. Melissa A. Guseynov contributed reporting and analysis for this article. 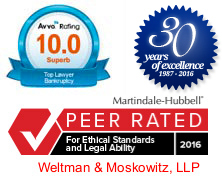 Michael L. Moskowitz and Richard E. Weltman are co-founders of Weltman & Moskowitz, LLP, a business law firm serving New York, New Jersey and Long Island. They concentrate on creditor’s rights, bankruptcy, commercial litigation, business divorce, partnership dissolution, and alternate dispute resolution, as well as on limited liability companies and corporations, including counseling, structure, governance, and preparing and negotiating many types of secured lending, leasing, shareholder, buy-sell, technology, and joint venture agreements. Michael or Richard may be reached at 212.684.7800 or 201.794.7500 and at mlm@weltmosk.com or rew@weltmosk.com.